After entering Celadon City, you will notice several Team Rocket Members within the city. By going to the Game Corner, you will find Jessie and James playing on some of the slot machines within it. The two will be discussing the Rocket Hideout, explaining to each other how to access it. By going to the Team Rocket Grunt in the back of the Game Corner and defeating him in battle, you will be able to access the Rocket Hideout by interacting with the poster he was guarding. Once inside the Rocket Hideout, you will have to battle waves of Team Rocket Members while trying to navigate through the tile puzzle mazes found throughout it. Your goal will be to find the Team Rocket Grunt that has hold of the Lift Key, an item that will grant you access to the elevator so you can reach an area on the bottom floor. 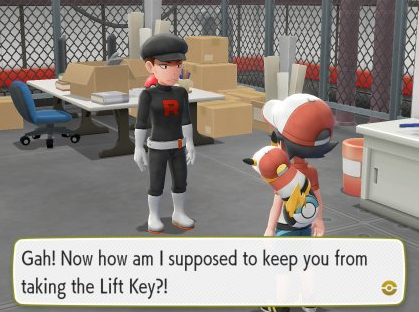 This Team Rocket Member will be found on Basement Floor 4, and after they are defeated, they will actually throw the Lift Key onto the railing over the wall. You will then gain control of your Starter Partner Pokemon in order to complete a puzzle through the air vents and obtain the Lift Key. Only after obtaining the Lift Key will you be able to use the elevator found within the Rocket Hideout. But be prepared, as three more difficult battles will lie ahead of the elevator on the bottom level. After defeating the Elite Four and starting the Master Trainers Challenge, you will find a number of Master Trainers within the Rocket Hideout. In total, there will be four Master Trainers to defeat.